Many events and people shaped the development of the parish we now know as St. John Vianney. From the beginning, important contributions have been made to the enrichment of our community by committed individuals and families. These founding members survived many inconveniences and made the sacrifices necessary to meet their obligation to God and their community. They carried our Catholic legacy of stewardship, offering time, talent and treasure whenever and wherever it was needed. As a result of their commitment to Christ and spirit of dedication, the church and school were built, and a strong Catholic community was established. On January 5, 1958 the first Mass at St. John Vianney was celebrated in the mission church with Monsignor Terence Farrelly presiding, in what we now call our Parish Social Hall. Since then our community has grown and evolved to over 4000 families! Read below to learn how St. John Vianney parish evolved into the dedicated community it is today. HOW DID ST. JOHN VIANNEY CATHOLIC CHURCH GET ITS NAME? In September 1957, plans were on the drawing board for a mission parish under St. James Cathedral when Monsignor John Bishop died. Monsignor John Bishop led Orlando Catholics through the sorely taxed capacity of the old St. James Church, adding a wing in 1941, and then building a new church. He took care of St. Margaret Mary Church, which became a separate parish in Winter Park in 1948. He gave advise to Monsignor Bartok who was building the first central Catholic high school in Central Florida. As a result of his selfless dedication, the general feeling of the community was that the new mission’s name should be named “John” in memory of Monsignor Bishop. Accordingly, the church was dedicated in March, 1958, and named for St. John Vianney, patron of parish priests. Construction began in 1957 as a mission church of St. James Parish under supervision of Monsignor John Bishop. The church was blessed by Monsignor John McNulty in March 1958 and named St. John Vianney, in memory of Monsignor John Bishop. In August, 1959, Rev. Vincent E. Smith became pastor of St. John Vianney and served until August, 1965. The first social hall was built in 1959 by the people of the parish. Under Fr. Smith’s leadership, aided by a corps of faithful volunteers, St. John Vianney parish progressed significantly. In 1961 the church ceiling was insulated, air conditioning and terrazzo flooring was installed and out brick decor was laid. On January 25, 1962, St. John Vianney School opened with primer and first grade taught by lay staff. Then, in 1963 a five-room addition brought the school to twelve classrooms, a convent was built and four Sisters of St. Francis of Glen Riddle, Pennsylvania, provided the teaching staff. The 1963-1964 school year began with Sister M. Euthalia, O.S.F. as the first principal, and three other members of her community supplemented by lay staff. It took more staff, another classroom and a new bus to take care of the 575 pupils enrolled in the school in September, 1964. Military families’ children traveled back and forth for daily classes; another busload made a long round trip from Kissimmee. In 1965 Father Smith left St. John Vianney, and Rev. William Corry became the new pastor. He inaugurated two kindergarten classes showing how many young families had moved to the parish. The church and school continued to thrive. Blessed Trinity parish was formed from St. John’s in 1965. 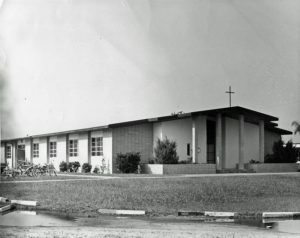 In 1966 the school grew to grades K – 8 with two classrooms for each grade. The first Parish Council was established in 1968. In 1969 Sr. Irma Francis became the principal of the school. Fr. William Keene was appointed pastor in 1970 and the the rectory was enlarged. In January 1972, St. John Vianney parish started a folk Mass at the Contemporary Hotel of Walt Disney World. This was the forerunner of Holy Family Catholic Church’s hotel ministry. It was in 1972 that Fr. Keane appointed the first Extraordinary Eucharist Ministers. St. Trinata became principal of the school in 1972. In 1973 Fr. Jose Ruiz replaced Fr. Keane as pastor. In 1975 Sr. Rosaire Marie became the principal. Also in 1975 Holy Family parish was established from St. John’s parish. In 1976 Rev. Stephen McNicholas became the new pastor. Formerly a pastor’s assistant at St. John Vianney he returned and began the process of building the permanent church and social hall at a cost of $800,000. He showed that Orlando was the fifth in the nation’s growth areas due to tourism, the making of Orlando International Airport a port of entry to the U.S., and Disney’s proposed “EPCOT”. As other major tourist attractions boomed and new business was drawn to Orlando, it was projected that more people would locate in south Orlando to be near their work. Even though St. John Vianney families struggled with babies, budgets, and mortgages, Father McNicholas placed the cornerstone in the new church on December 9, 1979. Bishop Grady blessed the new church on March 15, 1981. More than 900 families contributed $582,000 to build the new church at a cost of $750,000, to make a social hall from the first church at a cost of $100,000, and to landscape for $50,000. It took ten months to build the church and convert the original church to a hall. Other history: In 1977 the Spanish Prayer group was started. In 1978 Sr. Rita Thomas became the principal. Mass in Spanish was added to the schedule in 1978. In 1984 Sr. Trinita became the principal again. In 1986 due to poor health, Father McNicholas gave over his pastor’s chair to Rev. Robert Kurber. Under Father Kurber’s leadership the young people of St. John Vianney began the custom of staging Living Stations of the Cross during Lent. Their Passion Play hit the road, too, performing indoors and out at St. Cloud, Canova Beach, Mims, and elsewhere, even in a local Methodist church. In 1991 the Ministries building was constructed and the original social hall was demolished. A wing of offices were added to the school. As south Orlando continued to grow the need for another parish emerged and Father Kurber left St. John Viananey in 1992 to establish a new parish, Holy Cross an off shoot of St. John Vianney. Rev. Lyle Danen then became pastor until Rev. Paul Henry took over the leadership of the parish in 1994. In 1993 Sr. Elizabeth Murphy returned to St. John’s as the school principal. 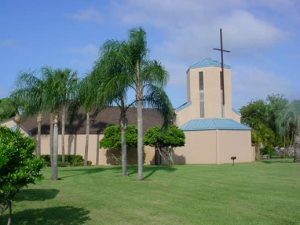 In January 1998, St. John Vianney celebrated 40 years as a Catholic parish serving the needs of its parishioners and the wider community in Central Florida. In order to sustain St. John’s vitality and continued growth, Father Paul with the leadership of the Parish Council initiated a Capital Campaign Fund drive to provide for the expansions, improvements, and renovations needed. A community center/gymnasium was built in back of the Ministry Building. The church underwent major renovations some of which included a new Chapel of Reservation and bell tower in the front of the church, a new Baptismal Font to accommodate full immersions, an elevated choir area, an enlarged courtyard and gathering area. The school added three new preschool classrooms and playground, a science lab and renovated other areas as needed. In November 2001, Bishop Norbert Dorsey blessed and dedicated the new preschool wing and new science lab. Through the dedication of various committees and individuals of the parish and the faithful contributions of the entire parish community, our Capital Campaign Fund drive raised over 4 million dollars from the contributions of 2,400 families. By April 2000, our ambitious dreams were realized when Bishop Norbert Dorsey rededicated the church and blessed the new community center. St. John Vianney parish entered the next millennium with an even greater ability to provide worship, educational and formation opportunities for all ages. In 2009, we celebrated 50 years of parish life at SJV with beautiful multicultural liturgies and various events that built fellowship among the community. A mosaic of St. John Vianney was installed in the Narthex and a time capsule was buried next to Mary’s outside chapel. Additionally, a new Capital Campaign, Alive In Christ, was begun to enhance our worship space and school. In 2010, through the contributions of the parishioners, Central Air Conditioning was installed in the school, replacing the individual units in the classrooms. This reduced noise-levels in the classrooms and regulated the temperature not only in the classrooms, but also in the hallways. In March 1, 2011, Fr. Miguel González was appointed Parochial Administrator of St. john Vianney Parish, and a new phase of growth for our community began. Through Alive In Christ Capital Campaign contributions, the remodeling of the Church also began. New tiles and pews were installed and the bathrooms were remodeled. While the church was being remodeled, Mass was celebrated in the Community Center. The parishioners and students were instrumental in putting together our weekly liturgies, since for over three months, the Community Center had to be set up every Friday and taken down every Sunday. We moved back into the church on November 27, which coincided with the implementation of the 3rd Edition of the Roman Missal and the new Liturgical year. Our parish community was excited to begin the new Liturgical year celebrating a more beautiful liturgy in a more beautiful worship space. We were excited to be able to provide this legacy for future generations to come. On April 14, 2012, Bishop John Noonan named Fr. Miguel González Pastor of St. John Vianney Parish. He served in SJV, with love and dedication, until June 30, 2017, when Fr. Thomas Walden took over the leadership of the parish in July 1, 2017. We rejoice in the present by giving back to our community from the blessings that God provides us today, and we look forward to a future in which God’s Kingdom is “at Hand’.